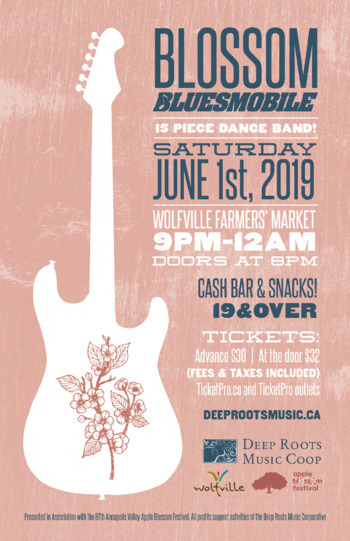 Come celebrate the #87th Annapolis Valley Apple Blossom Festival in style and dance the night away with maybe Atlantic Canada's very best Rhythm and Blues ensemble. The fifteen members of Bluesmobile are guaranteed to get you up on your feet and keep you there. The band features a 6 piece horn section, 5 piece rhythm section, and 4 vocalists. Bluesmobile plays music from many musical styles including blues, funk, rock, soul, and R&B. If you like artists such as Chicago, Earth Wind, and Fire, Santana, Tower of Power, Aretha Franklin, The Commodores, and Powder Blues you will love Bluesmobile! This year we are using any profits generated by the show to support a key element of our mission which is to provide accessible and excellent live music to audiences in the Annapolis Valley. Once again this year we have partnered with the Town of Wolfville to provide 9 free summer concerts at Waterfront Park. During our Festival (Sept 26-29) we will have free entertainment daily at Clock Park, Friday's Artists at Acadia University, Saturday morning at the Wolfville Farmers' Market' and at the Harmony Singing Workshop and Sunday morning at our Rise Up Singing event. This is in addition to all of our children's activities. Each year our Cooperative supports almost 40 hours of free music programming in addition to specialized programs such as our "Musicians in School" project. This is all possible due to the support of our community partners, sponsors and the nearly 200 volunteers that make it all happen. Cochrane's Pharmasave in Wolfville, Wilson's Pharmasave in Kentville and Berwick, Windsor Home Furniture in Windsor N.S.